Educator, nurse, civic and church leader, Elizabeth Fulton, at age seventeen, braved the dangers of traveling West to answer the call to become a teacher at the mission school at Tishomingo, Indian Territory, which is now Oklahoma. It is claimed that five of her pupils became chiefs of their respective Indian nations. 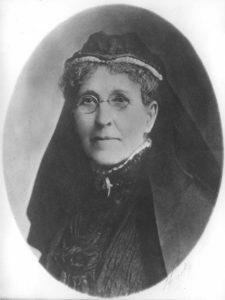 In 1859 she married George B. Hester, a prominent merchant. After attending General Conference with her delegate-husband in Atlanta in 1878, she returned home to form the first unit in her area of the newly-authorized Woman’s Foreign Missionary Society, and helped to form auxiliaries throughout the Indian Territory. When honored in 1928 at the Jubilee Celebration of the East Oklahoma Conference Woman’s Foreign Missionary Society, Elizabeth Hester had served as its president for fifteen years. She was also conference treasurer of the Woman’s Home Missionary Society for eighteen years, and a member of the Woman’s Missionary Council. Mrs. Hester was a nurse during the Civil War, spoke for women’s suffrage, and was active in many civic organizations. In 1928, she was the first person inducted into the Oklahoma Hall of Fame. Article taken from They Went Out Not Knowing… An Encyclopedia of One Hundred Women in Mission (New York: Women’s Division of the General Board of Global Ministries, The United Methodist Church, 1986). Used with permission of United Methodist Women.